My niece Viviana Carreras, who is three years old, is diagnosed with Congenital Myasthenia Syndrome. From the moment she was born she had many complications. She was born not breathing and had no muscle tone. Today she still suffers from muscle weakness and issues with swallowing and digesting food. Viviana’s muscle weakness causes her to be fed through a tube that pumps food straight into her stomach. Also, she takes several medicines daily that are suppose to help her muscles respond, but so far there has not been much improvement. Through all her problems none of them have affected her brain. Viviana is very bright for her age and never stops talking, just like her mother. 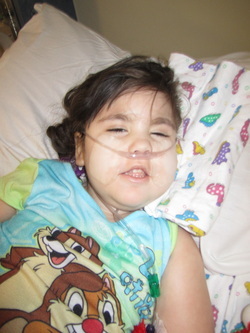 Viviana has been in and out of the hospital several times through her three years of life. She spends just as much time at the hospital as she does at home. As she gets older things are getting more complicated because she is growing at a rapid rate. Her muscle tone cannot catch up with her. The heavier she is, the harder it is to transport her and move her around places. During the night when she is sleeping she cannot even move her own arms, her head, or any body part like we do in the middle of the night. So, someone has to do it for her. Like I said she is very vocal and will say loudly, “head,” when she wants her head turned. She has been to several doctors, even to the Mayo Clinic in Minnesota where they diagnosed her with CMS (Congenital Myasthenia Syndrome). They gave her medicines and care to help her improve her condition, but nothing as worked. My family and I are still skeptical that she actually possesses this syndrome, even though several of her symptoms point to it. None of the treatments recommended for this syndrome have improved her position. Another factor that makes my family unconvinced is that the CMS is an inherited disease, but no one in my family has shown any signs related to this syndrome. At the Mayo Clinic, both of Viviana’s parents went through several tests such as blood tests and genetics test, but all have came back negative. My family and I are blessed to have Viviana in our lives. She is very special to us and we will continue to look for answers for her condition. Viviana in her kid cart!